In March, Image Comics will unearth the horror work of writer Rick Remender (BLACK SCIENCE, DEADLY CLASS, Uncanny Avengers, Captain America) and frequent collaborator Kieron Dwyer (Avengers, Captain America) in an oversized hardcover large enough to crush zombie skulls. CRAWL SPACE OMNIBUS, clocking in at 616 pages, collects Night Mary, XXXombies, Sorrow, Creatures, and Sea of Red, and features the art of Kieron Dwyer, Francesco Francavilla, Tony Moore, Salgood Sam, Paul Harmon and Peter Bergting. In Night Mary, a girl is trained to enter the dreams of the mentally disturbed to aid in their therapy. However, when Mary enters the labyrinthine mind of a serial killer, the boundaries between nightmare and reality begins to break down. Drawn by Kieron Dwyer, Night Mary is an unsettling work of psychological horror. XXXombies is a grindhouse-style gorefest set in 1977 Los Angeles, where a man shoots his way through a zombie scourge to retrieve his runaway daughter from the drug-fueled underworld of pornographers and gangsters. Co-written by Tony Moore (THE WALKING DEAD), XXXombies is drawn by Dwyer. Sorrow also draws from the grindhouse tradition, following a group of road-tripping friends who crash their car in small town and find themselves trapped in a bizarre, grotesque world cut off from civilization. Co-written by Seth Peck and drawn by Francesco Francavilla (Black Beetle, Captain America), Sorrow is a harrowing tale in stark black and white. Creatures, drawn by Peter Bergting (Hellboy: The Rillhorse), and based on a painting by the master of fantasy illustration, Frank Frazetta, imagines Teddy Roosevelt as an adventurer who must thwart an alien plot to help an ancient Mayan demon destroy planet Earth. The longest of the stories collected in CRAWL SPACE is Sea of Red, drawn by Dwyer, Salgood Sam, Paul Harmon, and Francesco Francavilla. A shipwrecked Spanish sailor questions whether death at sea would have been preferable after he’s rescued by marauding pirates who hunger not for gold but for blood — and turn him into one of them. Nearly five hundred years later, Marco Esperanza will finally get his chance at revenge. 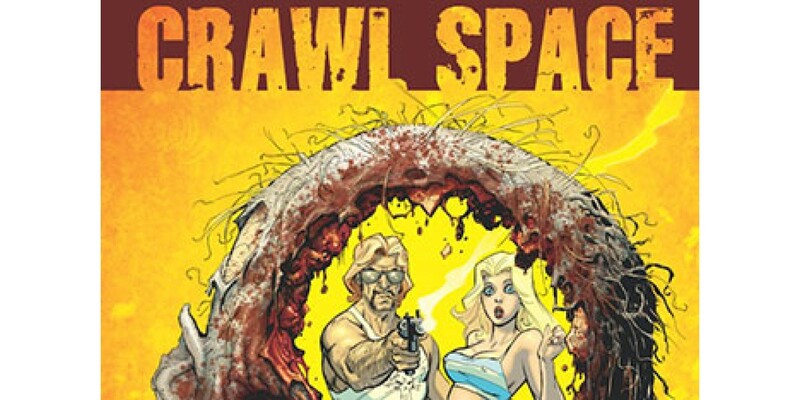 CRAWL SPACE OMNIBUS will be in comic book stores on March 12, bookstores on March 25, and is available for pre-order now. This truly massive collection of horror by one of comics’ top writers is a must-have for Remender’s fans, and the oversized pages showcase this murders row of all-star artists in all their gruesome glory.